ISEA Istanbul presents La Plissure du Texte — Chair Per­son: Elif Ayiter; Pre­sen­ters: Roy As­cott, Jan Baetens, Elif Ayiter, Max Moswitzer, Selavy Oh :: Sep­tem­ber 17, 2011; 1:00 – 2:30 pm :: Sa­banci Cen­ter Room 1, Sa­banci Cen­ter, Lev­ent. This panel will un­der­take a close scrutiny of La Plis­sure du Texte, tak­ing into ac­count both its cre­ation in 1983 and its re-cre­ation in 2010, dis­cussing the work in its role as a land­mark of New Media Art His­tory as well as an art work which has shown the ca­pa­bil­ity of re­gen­er­at­ing it­self as an en­tirely novel man­i­fes­ta­tion based upon the con­cepts of dis­trib­uted au­thor­ship, tex­tual mo­bil­ity, emer­gent semi­o­sis, mul­ti­ple iden­tity, and par­tic­i­pa­tory poe­sis. Roy As­cott’s ground­break­ing new media art work La Plis­sure du Texte (“The Pleat­ing of the Text”) was cre­ated in 1983 and shown in Paris at the Musée de l’Art mod­erne de la Ville de Paris dur­ing that same year. The title of the pro­ject, “La Plis­sure du Texte: A Plan­e­tary Fairy Tale,” al­ludes to Roland Barthes’s book “Le Plaisir du Texte”, a fa­mous dis­course on au­thor­ship, se­man­tic lay­er­ing, and the cre­ative role of the reader as the writer of the text. In 2010, La Plis­sure du Texte re-in­car­nated as a three di­men­sional, in­ter­ac­tive ar­chi­tec­ture cre­ated in the meta­verse and was pro­jected into Real Life in Seoul, Korea dur­ing the INDAF new media art fes­ti­val held at To­mor­row City, Songdo, In­cheon, through­out Sep­tem­ber 2010. Fol­low­ing As­cott’s orig­i­nal premise of dis­trib­uted au­thor­ship, the fairy tale is now being told by a text dri­ven ar­chi­tec­ture within which a pop­u­la­tion of ro­botic avatars tells the tale through end­lessly gen­er­ated con­ver­sa­tions which are har­vested from the On­line Guten­berg Pro­ject. Ad­di­tion­ally, vis­i­tors to the ex­hibit in the phys­i­cal realm may also con­tribute to the gen­er­ated text flow through SMS mes­sages or via Twit­ter. Thus all pleated text – the gen­er­ated, the con­tributed, and the stored – is si­mul­ta­ne­ously vis­i­ble as a mas­sive, ever evolv­ing lit­er­ary con­glom­er­a­tion. Roland Barthes’ canon­i­cal state­ment con­tains an un­der­stand­ing of tex­tu­al­ity that lies at the cen­ter of this chap­ter and in­deed in­formed the pro­ject it sets out to de­scribe. The term telem­at­ics has its ori­gins in the 1978 re­port to the French pres­i­dent by Alain Minc and Simon Nora con­cern­ing the con­vergence of telecom­mu­ni­ca­tions and com­put­ers, par­tic­u­larly in busi­ness and ad­min­is­tra­tion. Dis­trib­uted au­thor­ship is the term I coined to de­scribe the re­mote in­ter­ac­tive au­thor­ing process for the pro­ject La Plis­sure du Texte: A Plan­e­tary Fairy­tale, which is the prin­ci­pal sub­ject of this text. My pur­pose here is to ex­plore the ge­neal­ogy of the pro­ject, how the con­cept of mind­at-a-distance de­vel­oped in my think­ing, and how the over­ar­ch­ing ap­peal of the telem­atic medium re­placed the plas­tic arts to which I had been com­mitted as an ex­hibit­ing artist for more than two decades. The pro­ject arose in re­sponse to an in­vi­ta­tion in 1982 from Frank Pop­per to par­tic­i­pate in his ex­hi­bi­tion Elec­tra: Elec­tric­ity and Elec­tron­ics in the Art of the XXth Cen­tury at the Musèe Art Mod­erne de la Ville de Paris in the fall of 1983. Pop­per had writ­ten pre­vi­ously on my work, and I was con­fi­dent that his in­vi­ta­tion of­fered a per­fect op­por­tu­nity to cre­ate a large-scale telem­atic event that would in­cor­po­rate ideas and at­ti­tudes I had formed over the pre­vi­ous twenty or more years. La Plis­sure du Texte: A Plan­e­tary Fairy­tale (LPDT) sought to set in mo­tion a process by which an open-ended, non­lin­ear nar­ra­tive might be con­structed from an au­thor­ing “mind” whose dis­trib­uted nodes were in­ter­act­ing asyn­chronically over great dis­tances—on a plan­e­tary scale, in fact. As I ex­am­ine it in ret­ro­spect, I see how a com­plex­ity of ideas can cre­ate a con­text for a work whose ap­par­ent sim­plic­ity masks a gen­er­a­tive process that can bi­fur­cate into many modes of ex­pres­sion and cre­ation. It is the bi­fur­ca­tions of ideas speci.c to the con­text of LPDT—their branch­ing and con­verg­ing path­ways—that I shall ini­tially ad­dress in this chap­ter. The con­tent it­self is trans­par­ent, in­sofar as the text in its un­fold­ing is its own wit­ness. In the his­tory of new media art and dig­i­tal writ­ing, Roy As­cott’s La Plis­sure du Texte (Elec­tra, Musée d’Art Mod­erne, Paris, 1983), a work using telem­at­ics to cre­ate in real-time a world-wide, col­lec­tive nar­ra­tive (more specif­i­cally, a col­lab­o­ra­tive, multi-player fairy tale), has proven a wa­ter­shed mo­ment (Plis­sure, n.d.). Basic con­cepts and is­sues of au­thor­ship, text, in­ven­tion, and lin­ear­ity, among oth­ers, have been dra­mat­i­cally re­de­fined as well as im­ple­mented in a con­crete prac­tice (as much a process in it­self as a model for fur­ther de­vel­op­ment) of dis­trib­uted au­thor­ship, text as “work” (in­stead of “prod­uct”), users’ par­tic­i­pa­tion, and mul­ti­me­dia con­nec­tiv­ity, that it is no longer pos­si­ble to study the art and tech­nol­ogy field with­out tak­ing into ac­count this major achieve­ment. Putting the stakes of As­cott’s in­volve­ment with col­lab­o­ra­tive world-mak­ing even higher, the re­cent up­grade and recon­cep­tu­al­iza­tion of this sem­i­nal work in the meta­verse of Sec­ond Life, LPDT2, proves that the cre­ative po­ten­tial of La Plis­sure du Text is still in­tact, to say the least (LPDT2, 2010). Yet by cre­at­ing a dis­tance be­tween the “old” and the “new”, i.e. by mak­ing the (once) “new” now (sup­pos­edly) “old”, LPDT2 gives also the op­por­tu­nity to come back on an as­pect that may have been over­looked in the eu­phoric re­cep­tion of the truly utopian first ver­sion of the work, namely the ques­tion of its “read­ing”. So strong has been the em­pha­sis on the shift to­wards the new par­a­digm of par­tic­i­pa­tion and con­nec­tiv­ity, that the very ques­tion of the work’s read­ing did no longer seem rel­e­vant. Read­ing in­stead of “doing”, “per­form­ing”, “cocre­at­ing” La Plis­sure du texte seemed an ex­am­ple of McLuhan’s “rear-view mir­ror” ap­proach of the fu­ture: (1967: 74-75). The ne­glect of read­ing, how­ever, is not fully mo­ti­vated here. First be­cause read­ing is much more than just de­cod­ing the words of a text, it has also to do with the var­i­ous stances and at­ti­tudes one takes to­wards a work (in this sense, read­ing has to do with global cog­ni­tive and cul­tural is­sues of “per­cep­tion”). Sec­ond be­cause As­cott’s key in­no­va­tion has not been made from scratch. La Plis­sure du texte is in­debted to all kind of tex­tual an­ces­tors (texts, mod­els, au­thors). The rev­o­lu­tion it brings about is not a tab­ula rasa, yet one new (big) leap in the his­tory of art as con­nec­tiv­ity, and it is plau­si­ble to argue that the re­la­tion­ship with this cul­tural and lit­er­ary con­text, and hence the read­ing of it, is part of the work it­self, so that par­tic­i­pa­tion can only be com­plete if one takes also into ac­count the work’s back­ground. 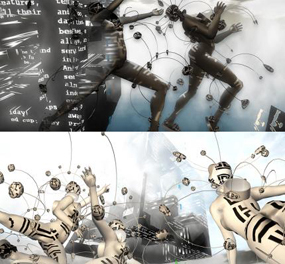 LPDT2 is the meta­verse in­car­na­tion of Roy As­cott’s ground­break­ing new media art work La Plis­sure du Texte (“The Pleat­ing of the Text”), cre­ated in 1983 and shown in Paris at the Musée de l’Art mod­erne de la Ville de Paris dur­ing that same year. The title of the pro­ject, “La Plis­sure du Texte: A Plan­e­tary Fairy Tale,” al­ludes to Roland Barthes’s book “Le Plaisir du Texte”, a fa­mous dis­course on au­thor­ship, se­man­tic lay­er­ing, and the cre­ative role of the reader as the writer of the text. As was also the case in its first in­car­na­tion “dis­trib­uted au­thor­ship”, a term coined by As­cott has been the pri­mary sub­ject of in­ves­ti­ga­tion of LPDT2. A text gen­er­a­tor telling a non-lin­ear, multi-faceted, often times po­etic, story har­vested from the fa­mous on­line Guten­berg Pro­ject is now dis­trib­ut­ing its out­put amongst ar­chi­tec­ture and its in­hab­i­tants, gen­er­at­ing di­a­logues and it­er­a­tions tak­ing their tra­jec­to­ries from mas­ter­works of clas­si­cal lit­er­a­ture. The pleat­ing re­sem­bles mu­si­cal sam­pling, the con­nec­tion be­tween the sen­tences fades, text be­comes noise, from which the au­di­ence gen­er­ates mean­ing. The struc­ture on the sim­u­la­tor adds yet an­other layer of pleat­ing by vi­su­ally mix­ing the dif­fer­ent sources of text, while yet an­other layer of tex­tual input will be pro­vided through a con­tri­bu­tion by i-DAT.​org from the Uni­ver­sity of Ply­mouth, UK, by means of which Real Life vis­i­tors will be able to con­tact the LPDT2 by send­ing SMS mes­sages. Thus all pleated text – the gen­er­ated, the con­tributed, and the stored – is si­mul­ta­ne­ously vis­i­ble as a mas­sive, ever evolv­ing lit­er­ary con­glom­er­a­tion. Roy As­cott is a British artist and the­o­rist, who works with cy­ber­net­ics and telem­at­ics, born in Bath, Eng­land. From 1955-59 he stud­ied Fine Art at King’s Col­lege, Uni­ver­sity of Durham under Vic­tor Pas­more and Richard Hamil­ton. On grad­u­a­tion he was ap­pointed Stu­dio Demon­stra­tor (1959–61). He then moved to Lon­don, where he es­tab­lished the rad­i­cal Ground­course at Eal­ing Art Col­lege, which he sub­se­quently es­tab­lished at Ip­swich Civic Col­lege, in Suf­folk. He was a vis­it­ing lec­turer at other Lon­don art schools through­out the 1960s. Then he briefly was Pres­i­dent of On­tario Col­lege of Art and De­sign, Toronto, be­fore mov­ing to Cal­i­for­nia as Vice-Pres­i­dent and Dean of San Fran­cisco Art In­sti­tute, dur­ing the 1970s. He was Pro­fes­sor for Com­mu­ni­ca­tions The­ory at the Uni­ver­sity of Ap­plied Arts Vi­enna dur­ing the 1980s, and Pro­fes­sor of Tech­noetic Arts at the Uni­ver­sity of Wales, New­port in the 1990s. As­cott is also the found­ing pres­i­dent of the Plan­e­tary Col­legium, an ad­vanced re­search cen­ter which he set up in 2003 at the Uni­ver­sity of Ply­mouth, UK, where he is Pro­fes­sor of Tech­noetic Arts. In 1964 As­cott pub­lished “Be­hav­iourist Art and the Cy­ber­netic Vi­sion”. In 1968, he was elected As­so­ci­ate Mem­ber of the In­sti­tu­tion of Com­puter Sci­ence, Lon­don (pro­posed by Gor­don Pask). In 1972, he be­came a Fel­low of the Royal So­ci­ety of Arts. His first telem­atic art pro­ject was La Plis­sure du Texte (1983), an on­line work of “dis­trib­uted au­thor­ship” in­volv­ing artists around the world. The sec­ond was his “gesamt­daten­werk” As­pects of Gaia: Dig­i­tal Path­ways across the Whole Earth (1989),an in­stal­la­tion for the Ars Elec­tron­ica Fes­ti­val in Linz, dis­cussed by Matthew Wil­son Smith in The Total Work of Art: from Bayreuth to Cy­ber­space, New York: Rout­ledge, 2007. Jan Baetens is pro­fes­sor of cul­tural stud­ies at the Uni­ver­sity of Leu­ven (KUL). His re­ser­ach top­ics range from French po­etry (which he also prac­tices as a pub­lished poet) and word and image it­er­ac­tions in so-called minor gen­res (graphic novel, photonovel, nov­el­li­sa­tion). He has writ­ten and edited var­i­ous books, among which re­cently: “Pour le ro­man-photo” (Brus­sels, Les Im­pres­sions Nou­velles, 2010), and “Con­strained Writ­ing”, a dou­ble spe­cial of Po­et­ics Today, co-geuste­dited with JJ Pou­cel (vol. 30-4, 2009 and 31-1, 2010). Elif Ayiter is a de­signer and a re­searcher, teach­ing at Sa­banci Uni­ver­sity, Is­tan­bul. Her texts have been pub­lished at aca­d­e­mic jour­nals such as the Jour­nal of Con­scious­ness Stud­ies and Tech­noetic Arts. She has pre­sented cre­ative as well as re­search out­put at con­fer­ences in­clud­ing Sig­graph, Cre­ativ­ity and Cog­ni­tion, Com­pu­ta­tional Aes­thet­ics and Cy­ber­worlds. She is also the chief ed­i­tor of the jour­nal Meta­verse Cre­ativ­ity with In­tel­lect Jour­nals, UK and is cur­rently study­ing for a doc­toral de­gree at the Plan­e­tary Col­legium, CAiiA hub, at the Uni­ver­sity of Ply­mouth with Roy As­cott.